Rim To Rim has both a 5K and a 10K run. Both are basically an "out and back". The race starts in Parking Lot A at the Royal Gorge Bridge & Park. All runners will be on a paved road leading out of the Park for about .7 miles (this is all up hill) and turn right onto a dirt road that loops thru a picnic area. All 5K runners will be turned around before completing the full picnic loop and will then backtrack to the paved road, returning to Parking Lot A, going to the left of the ticket booths at the Main Gate of the Royal Gorge Bridge & Park, and then crossing the Bridge for 1/4 mile to the FINISH LINE! The 10 K runners will complete the full picnic loop and return to the paved road where they will bear right for 1/4 mile, turning right onto a dirt road which leads to camping areas. They will continue for about 1 mile to a water/aid station where they will be turned around to backtrack - back to the paved road, taking a left to the picnic loop, run the picnic loop again, returning to the paved road where they will turn left to return to Parking Lot A, running to the left of the ticket booths at the Main Gate of the Royal Gorge Bridge & Park, and then crossing the Bridge for 1/4 mile to the FINISH LINE! The 1/2 marathon will start in Parking Lot A at the Royal Gorge Bridge & Park. All runners will begin by running towards the Royal Gorge Bridge. Runners will make their way across the bridge and follow the road (South 3 A) up past Tommy Knocker Children's Playland. They will continue on this road for approximately 5 miles. 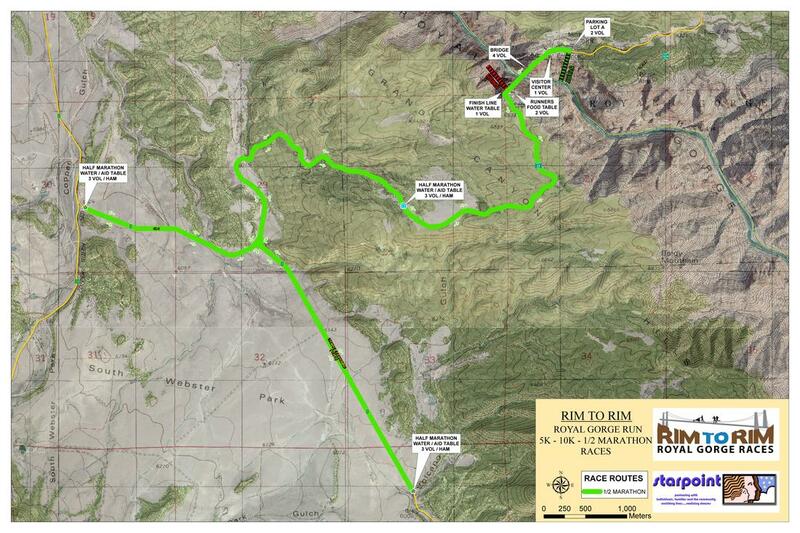 Runners will turn around just before the cattle guard (before Gulch Road) and head back towards Temple Canon Road where they will take a right and run on dirt road for approximately 1.7 miles, at which point, runners will head back towards South 3A where they will turn right. Runners will continue to the FINISH at the Bridge. There will be water/aid stations at mile markers 3, 5 and 7. Runners will hit mile marker "3's station" on the way back, making 4 total opportunities to hydrate.